Manchester Untied will be traveling to United States in the 2018 Pre-season tour which will take place in July and United are set to compete in International Champions Cup US leg where they will play at-least five friendly games. The tour officially confirmed by United and they will be playing highly lucrative friendly games against the likes of Liverpool, AC Milan and Real Madrid. 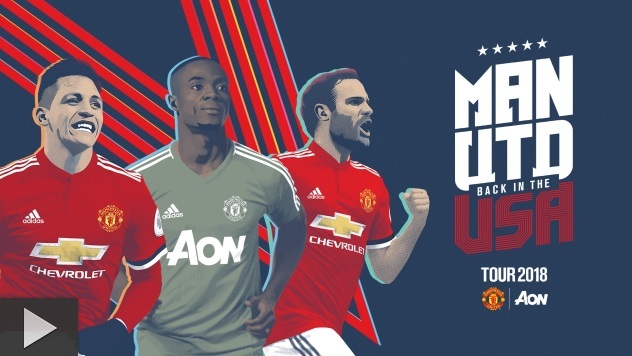 Manchester United Pre-season Tour 2018 – International Champions Cup 2018 teams and fixtures are officially confirmed and Jose Mourinho’s side will be playing an extensive US tour and will be part of highly lucrative pre-season tournament in the states where they play 5 matches in two weeks. Three games confirmed are against the likes of Real Madrid, Liverpool and AC Milan. While United will start the tour with two friendly games against Club America and San Jose Earthquakes on 19 and 22 July respectively. United are pushing for a training base in University of California, Los Angeles (UCLA) and two venues are confirmed as Levi’s® Stadium, Santa Clara and FedExField, Landover. Manchester United Premier League 2018-19 Fixtures: The full fixture list for premier League will be announced on Wednesday, 13th June 2018 and Manchester United will be starting their season with the opening game on the weekend of 18-19 August 2018. Manchester United toured United States in twice in a row before they signed up to visit China last season where United have a massive support. United have a huge support in United States and their friendly games Real Madrid back in 2014 was attended by record number of (100,000) in Michigan. Lies. Michael Carrick testimonial has been “confirmed” by the club to be @ the beginning of June. So why should we believe anything else that’s “confirmed”? Wish Manchester United the very Best against the five pre-season matches especially, against Real madrid, Barcelona and Manchester City. Up Jose Mourinho but we still need our independent, fragile captain Wayne Rooney in all these matchea together with all newly signed players.